Fixed Camera « Global Market Insights, Inc. 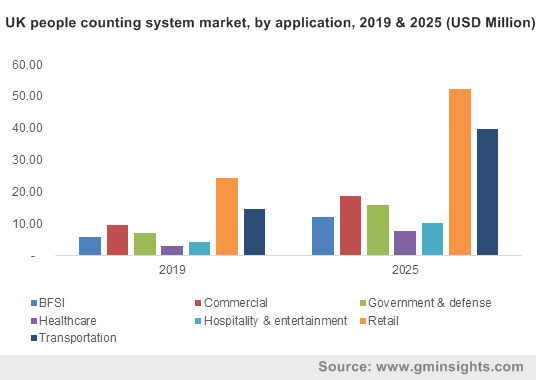 The global people counting system market is poised to witness remarkable growth in the years to come, owing to the robust adoption of digitized systems for supporting regular operations across a number of application domains. These systems provide installers with numerous operational enhancement benefits like tracking the busiest time slots as well as staff optimization. Further, the rising awareness of business intelligence platforms in a number of industries like hospitality, entertainment, and retail is creating huge demand as well, for enhanced customer tracking solutions. It is imperative to state that the people counting system market is also witnessing a technological evolution, like the development of behavior analysis technologies, thermal imaging counters, and 3D stereographic components. These advancements have been captivating core industry players to adopt innovative technologies that will help drive the people counting system market growth in the years to come. A rise in the demand for effective technologies for analyzing, detecting and converting potential customers, and enhancing profitability and business is a crucial factor that will propel the people counting system market. A number of industrial sectors like clubs, pubs, restaurants and hospitals are witnessing high adoption of this technology to track the number of customers that are entering or exiting the facility. Such systems also assist companies in developing effective marketing and sales strategies to attract customers and analyze their buying behavior. Strategies like these would further assist them in competing with prominent companies in terms of sales revenue and the customer base. Regionally speaking, North America has been touted to emerge as a viable growth ground for people counting system industry. Powered by the presence of numerous system developers in application industries and the robust adoption of technical advancements across the economies of U.S. and Canada, the North America people counting system market size has been growing at an exceptionally rapid pace. The regional industry is touted to depict commendable gains in the years ahead, as the continent continues to witness the proliferation of technologically advanced transportation facilities incorporating automated management systems and the smart city projects. The surveillance industry is remnant of very specific challenges and core players often seek to achieve benefits from niche applications like surveillance in psychiatric wards, interview rooms, and elevators which are commonly left unaddressed by standard products available in the market. To tackle this problem, the Sweden-based Axis Communications has recently introduced two specialty camera models for corner-mount use, with distinct design features for meeting specific use cases. One of the camera models has a perfect design to blend into the aesthetic in elevators, while the other is ligature-resistant (anti-ligature), ideal for the healthcare sector, among many others. Such product advancements by notable industry players are anticipated to drive the commercialization landscape of the people counting system market in the years to come. As a part of its exponential growth tactics, V-Count in the recent years, has executed aggressive expansion plans to establish itself in major regions across the globe. In December 2017, the company had made its debut in Dubai, owing to the city’s dynamic, tech-savvy market and its strategic location, which made it an ideal location for V-Count‘s new offices. This move was a part of continuous effort from the company to expand its presence, and respond to the increasing demand for retail analytics and advanced people counting solutions. The company further made its entry in the UK and other European markets for supporting both new and existing customers in implementing powerful analytics technologies across their businesses. Regional expansion tactics thus, are bound to help augment the scope of the people counting system industry in the forthcoming years. Considering the aforementioned efforts undertaken by prominent industry players, it is clear that the people counting system market would depict tremendous growth in the coming years. The competitive spectrum of this industry is quite diverse, and consists of renowned companies such as HELLA Aglaia Mobile Vision, RetailNext Inc., Iris-GmbH Infrared & Intelligent Sensors, InfraRed Integrated Systems Ltd., Infodev Electronic Designers International Inc., FLIR Systems Inc. and Eurotech, among others. This entry was posted in Electronics and Media and tagged Commercial, Fixed Camera, Fixed Dome Camera, Global People Counting System Market, Government & defense, Healthcare, Hospitality & Entertainment, Infrared, Infrared Beam BFSI, People Counting System Market, People Counting System Market Size, PTZ Camera, Retail, Thermal Imaging, Transportation, Video-Based.